Civil War hero Buffalo Bill Cody changed the face of entertainment when his Wild West show began touring the country in 1883. Buffalo Bill’s operation, which included mock bison hunts and Indian war reenactments, bronco riding and roping, and marksmanship competitions, went on to engender a number of other imitators, including Pawnee Bill’s Wild West Show, the Miller Brothers’ 101 Ranch Wild West Show, and California Frank Hafley’s Wild West Attractions, which traveled the United States from 1905 to 1940. While displays of masculinity were prominent in these shows, just as important was their showcasing of the skills necessary for “surviving” in the “Wild West,” abilities that women like Annie Oakley and Calamity Jane had in spades. Hafley’s show heavily featured women in rodeo events like the sharpshooting comedy routine in which Lillian Smith, a former competitor of Annie Oakley’s and Hafley’s first wife, shot targets from the mouth or head of Mamie Francis, Hafley’s second wife. As we prepare to plummet, we might spare a thought for Titus Flavius Caesar Vespasianus Augustus (better known as Vespasian); he died on this date in 79 CE. Vespasian was crowned Emperor of Rome in 69 after a year of civil strife following the death of Nero; he served for six years and founded the Flavian Dynasty that ruled the Empire for another 20 years. 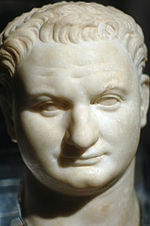 Vespasian was judged (by Suetonius and others) to have been a witty and effective ruler, even as he had to govern through severe financial turmoil. Indeed, to this day urinals are known in Italian as vespasiano, a vestige of Vespasian’s tax on urine (which was valuable in his day for its ammoniac content). Vespasian is also remembered for a series of large construction projects that he undertook during his reign– the largest of which was “The Flavian Amphitheater”… or as we now know it, the Roman Colosseum.